This prefecture in Japan is the least populous but produces the most crabs in the whole country. The Tottori Prefecture is located in the west of Honshu Island, the largest piece of land in Japan. The region’s north end borders the Sea of Japan; the water quality and depth there provide optimal living conditions for crabs. Because of that, Tottori reigns when it comes to the amount of crabs caught nationwide—three times more than that of Hokkaido. And no matter what variety you get, freshness is guaranteed. 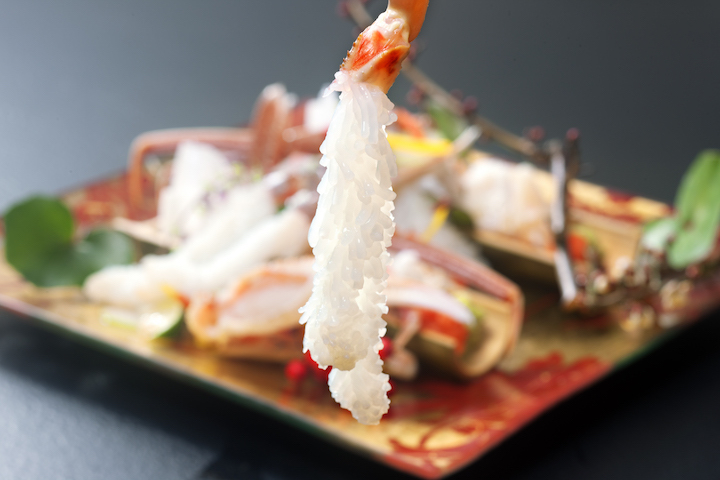 Snow crab, or zuwaigani, is the most dominant crab variety in Japan, and how it is called varies according to location. In Tottori—and the San’In region it belongs to—male snow crab is known as matsuba, while the egg-bearing female crab is named oyagani. Beni-zuwaigani is another local favorite, nicknamed “the taste of autumn." But when it comes to the most sought after, itsukiboshi, the rarest, most superior type of matsuba, is simply unrivaled. There is an endless supply of beni-zuwaigani crab in the city of Sakaiminato, Tottori from September to June. Characterized by the tall shell and flat legs, beni-zuwaigani is the most common variety of crab found in Tottori. The designated fishing period starts on September 1 and ends on June 30 the year after. This crab lives in the deep sea, and its meat doesn’t preserve well over time once ashore. Therefore, it is often used to produce processed foods. If you want to taste fresh beni-zuwaigani, a trip to Sakaiminato is a must. The city in Tottori has a local speciality called beni-zuwaigani crab rice, in which the crustacean’s sweetness and umami are accentuated after steamed en papillote with vinegary rice and other ingredients. Matsuba crab sashimi tastes fresh like the ocean. If beni-zuwaigani announces the arrival of autumn, the matsuba crab fully epitomizes winter’s intensity. Not only is it obtained when the Sea of Japan is at its fiercest, its meat is bursting with natural sweetness. Most diners take their time savoring every bite, letting the flavors penetrate their mouth. The peak season of matsuba lasts only from early November to early March, which further contributes to its value. Shunichi Suzuki, Director of Tourism and Exchange Bureau, Tottori Prefectural Government, described with enthusiasm how the Tottori locals enjoy the much-prized crab. The fish market auctions happening in the cities of Tottori and Sakaiminato might seem more relaxed than Tsukiji in Tokyo but pricey deals are a usual occurrence. 1. The shell measures at least 13.5 centimeters in length. 2. The crab weighs at least 1.2 kilograms. 3. The legs are intact and spread out beautifully. 4. The crab shows a bright color with a glossy surface. 5. The meat is firm and plump. Among all the crabs in Tottori, only about 1.5% satisfies such high standards. So rare is itsukiboshi that there’s no stopping of its surge in value. Each crab cost 700,000 yen in 2016; the newest record is 1.3 million yen. Hotpot with matsuba crab isn’t only delicious. It warms your entire body. The restaurant offers three set menus with prices starting from 25,000 yen. “The chefs there are fantastic. The crabs they choose are surely the best in quality and the freshest,” adds Suzuki. A guesthouse with more than 200 years of history, Yamadaya is renowned for a complete holiday experience beginning with a hot spring in front of sweeping views of the sea. 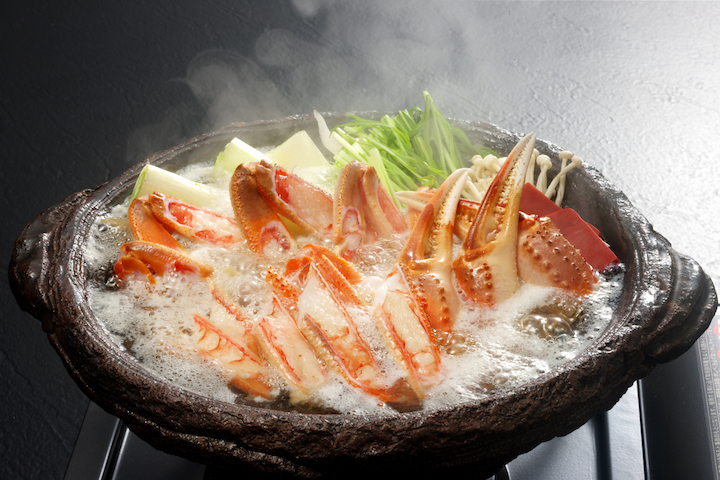 It is followed by an impeccable crab feast with crab sukiyaki being the star of the show. The broth, made with a secret recipe, takes the crustacean several levels up the umami scale alongside homemade ponzu. The dinner can be booked separately for those who prefer to not stay overnight. Opening Hours: 4:00 p.m. - 10:00 p.m. This venture started off as a seafood dealer in the first year of the Meiji period (1868). It takes the current shape as a restaurant when the Heisei Period (1989) began. Located next to the harbor of Tottori, guests can crack the crabs open while taking in idyllic views of a fishing village. “The prices there are very reasonable," says Suzuki. "An all-encompassing meal with crab costs only around 10,000 yen.” If dining in isn’t enough to satisfy your crustacean cravings, Wakabayashi’s retail shop also sells fresh or cooked matsuba and beni-zuwaigani crabs. This article was written by Xiaoshan and translated by Vincent Leung. Click here to read the original version of this story. Making your own fragrant lobster-infused oil is an easy, delicious way to add depth of flavour to many other dishes. The search for his favourite fish brought Tan Ken Loon, owner of The Naked Finn, to this sleepy Japanese port town rich in history and local produce. Get hot and steamy at these places which let you cook your own food in boiling soup — each with its own special twist.